The Portland Thorns will look to win their second NWSL championship in their five-year history on Oct. 14. They defeated the Orlando Pride in Portland, 4-1, on Oct. 7 to advance to the title match. The championship match will be played at Orlando City Stadium in Orlando, Florida. Start time is set for 1:30 p..m (PT). The match will be televised on the Lifetime network. The Thorns won the inaugural NWSL championship in 2013 when they beat the West New York Flash, 2-0, to cap the 2013 season. Tobin Heath, who remains on the Thorns roster, was named Most Valuable Player in that match. 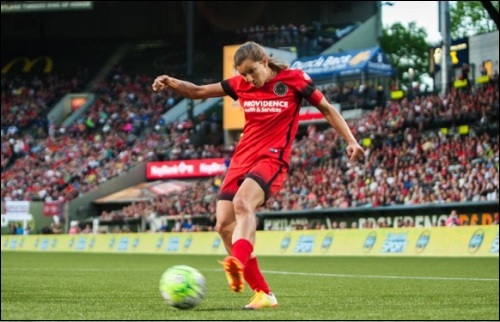 PORTLAND, Ore. -- The Portland Thorns earned a spot in the National Women's Soccer League championship with a 4-1 victory over the Orlando Pride on Saturday. The Thorns face the winner of Sunday's game between the North Carolina Courage and visiting Chicago Red Stars. The league's title game is set for next weekend in Orlando. Amandine Henry opened the scoring for the Thorns in the 12th minute, and defender Emily Sonnett added a goal three minutes later. Alanna Kennedy narrowed the gap with a goal for the Pride in the 23rd minute. Hayley Raso and Christine Sinclair each scored late in the second half for the Thorns, who won the league's inaugural championship in 2013. "What a group and team effort that was. If you could draw up a playoff win to start this playoffs, to have everybody involved and everybody impacting and influencing the game like we did today, it would be the way you'd draw it up," Thorns coach Mark Parsons said. The crowd at Providence Park was announced at 18,193. The NWSL is wrapping up its historic fifth season. No other professional women's soccer league in the United States has lasted as long. The Thorns also opened the season against the Pride, with Sinclair scoring in a 2-0 victory. It was the first of a league-record 10 wins at home for Portland. "I thought 4-1 was an unfair scoreline for the effort and the commitment and the performance of our players today," Orlando coach Tom Sermanni said. Portland has never lost to Orlando, going 4-0-1. The Thorns lost at home in the semifinals last season to the Western New York Flash, which went on to win the 2016 championship. The Flash moved to North Carolina in the offseason and became the Courage. "It was our motivation all year. Last year we left our fans disappointed. We were disappointed," Sinclair said. "All year it was our focus to, not only host a playoff game, but then win it. It was a statement from us." The Pride, with a lineup that includes U.S. women's national team forward Alex Morgan and Brazilian star Marta, were hurt when it was revealed this week that Brazilian midfielder Camila was out with an ACL tear in her right knee. The Thorns were boosted by the return of Tobin Heath, who made her first start after being sidelined for most of the season with a back injury. This season was the first that the league has had a national-broadcast deal. The Lifetime channel featured an NWSL game each Saturday as part of a deal struck with A+E Networks, which bought a stake in the league and became a sponsor.